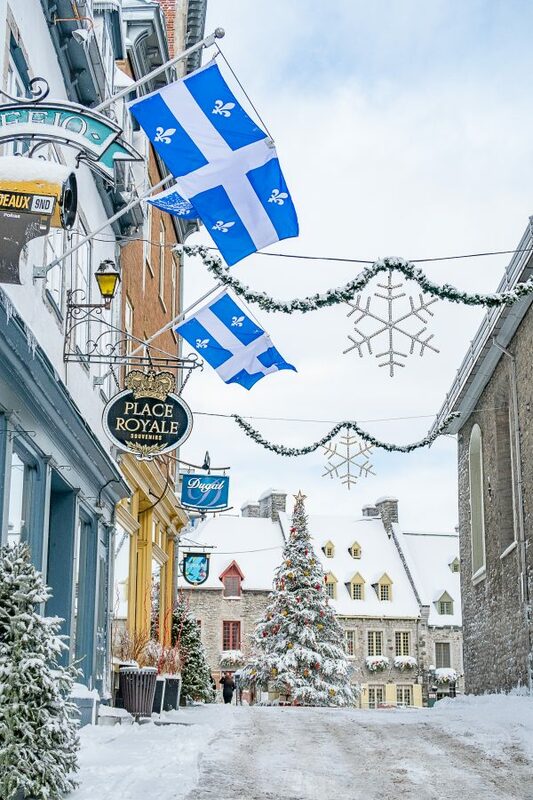 A guide of what to do in Quebec City in winter – all the can’t miss activities and things to do! 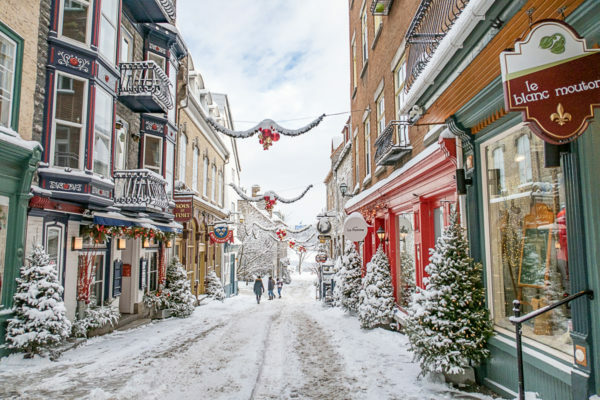 Quebec City with its cobblestone streets, colorful buildings, and shops with elaborately carved wooden signs, has an old world European feel, even though the city isn’t far over the border and into Canada. 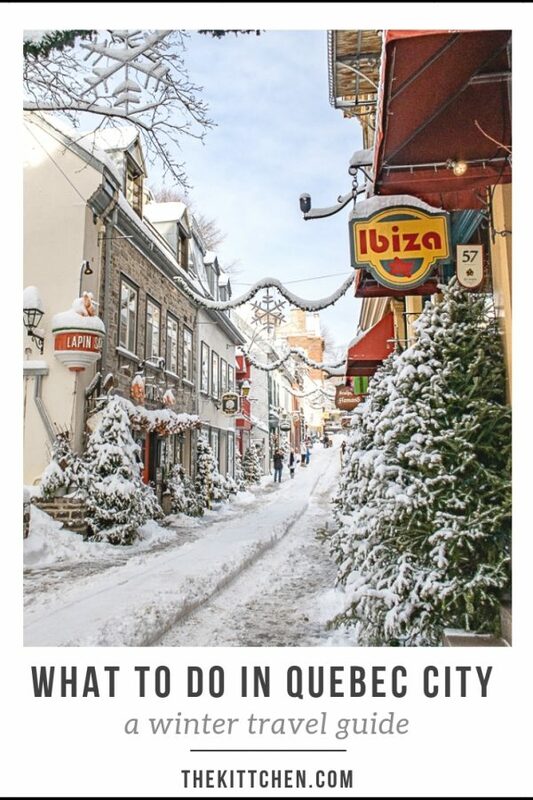 At Christmas the old quarter of the city becomes a magical wonderland with snow covered pines lining the narrow streets and festive decorations hanging overhead. 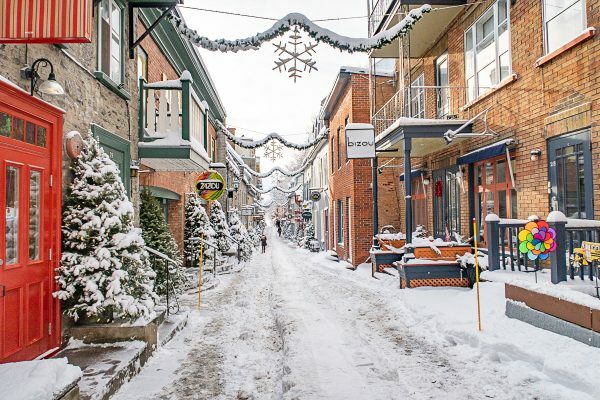 Quebec certainly earned its spot on the list of best places to spend Christmas. 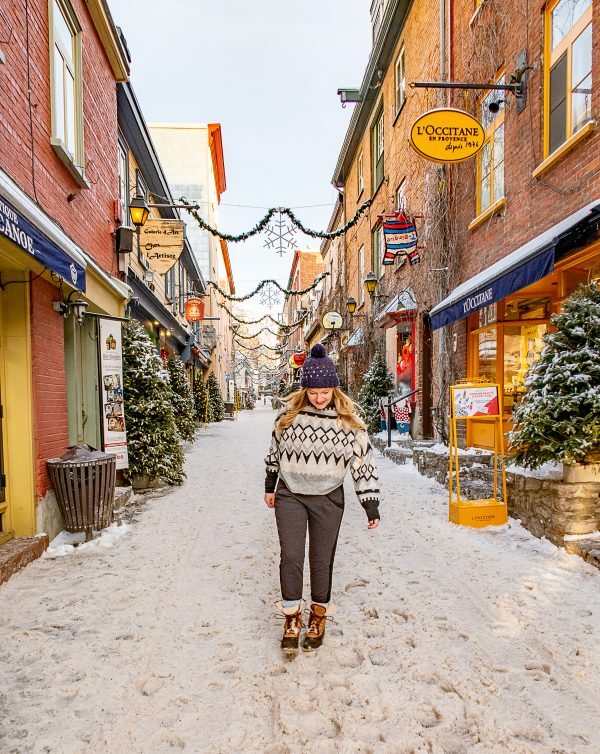 After spending Christmas in my hometown, Kennebunkport (also on the list of best places to spend Christmas), we drove to Quebec City with my sister and her husband, Andrew. The six hour drive involved a pitstop at a classic Maine general store, some slick roads, one moose crossing the road, and one quick border crossing. 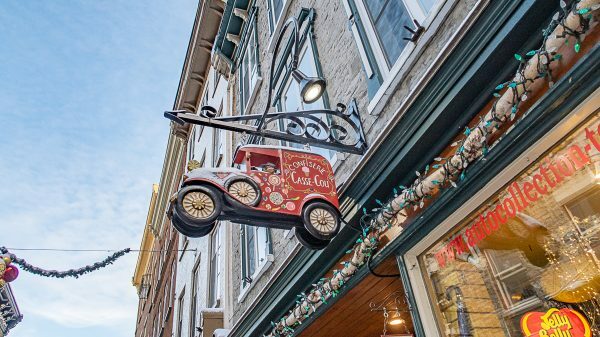 We split our time in Quebec City between discovering the darling city and spending time in nature. 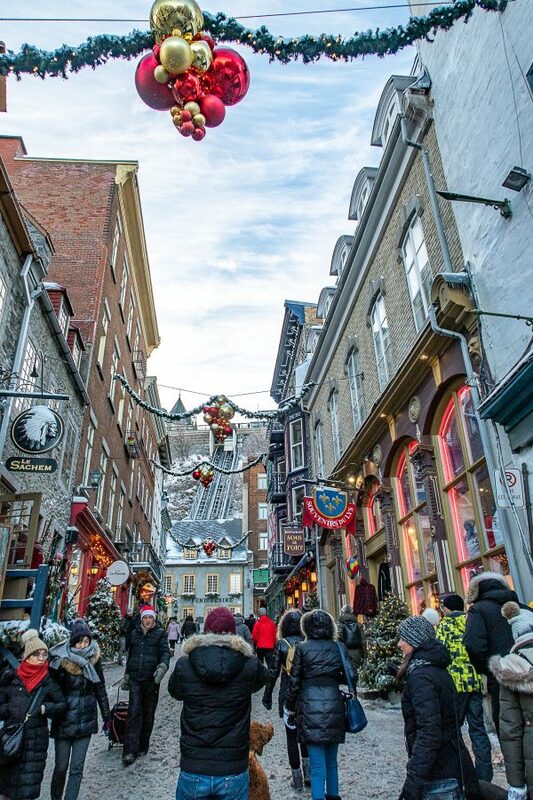 Located in Old Quebec City, this picture perfect area is filled with boutiques and restaurants. The stone buildings with mansard roofs and colorful shutters seem like the have fallen out of a fairy tale. As if that isn’t charming enough, the businesses all have the most elaborate and beautiful wooden signs. They are works of art. 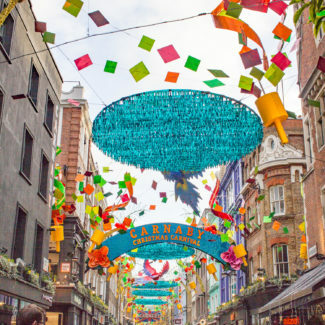 Not only is the neighborhood adorable, the shopping and restaurants are fantastic! I share my restaurant recommendations at the end of this post. 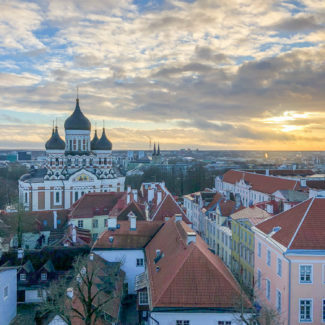 This historic district joined the UNESCO World Heritage List in 1985. 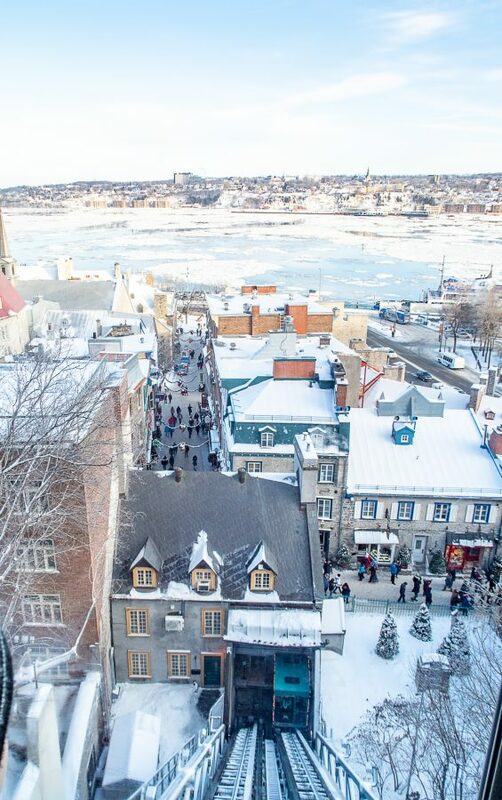 Riding the Old Quebec Funicular is a fun way to take in a view of the Quartier Petit-Champlain and the St. Lawrence River. 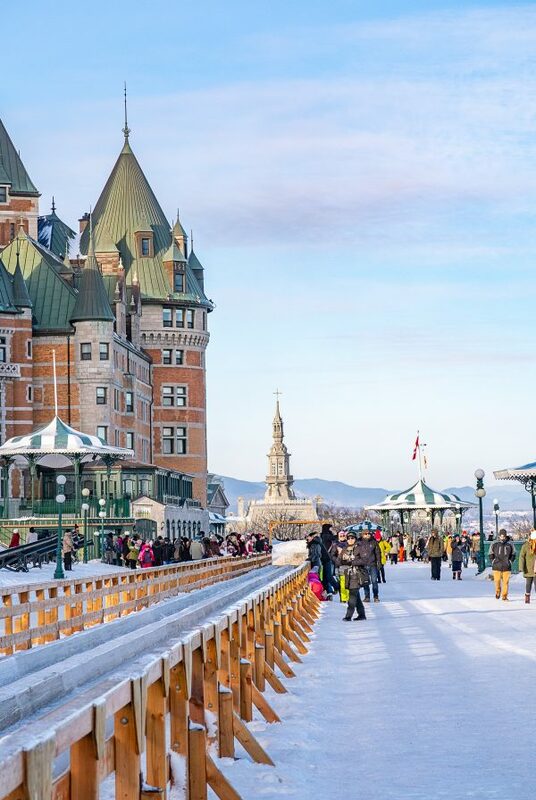 It’s also a way to avoid climbing some slippery steps to get to Dufferin Terrace, the town square beside the Fairmont Le Château Frontenac. There are several places to go ice skating in the city, and there are also some trails for forest skating just outside the city. If you want to go forest skating you need to bring skates. 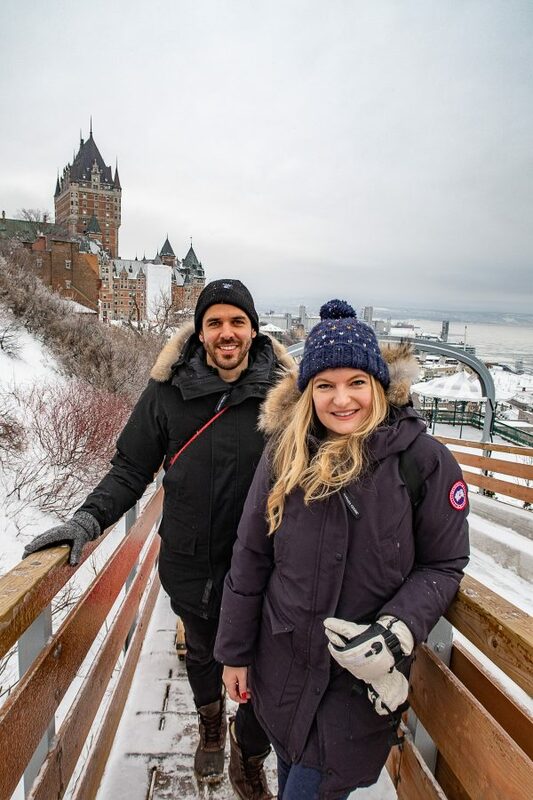 The four of us went to the famed toboggan track because it is just one of those things you do in Quebec City. We didn’t expect to love it, but we did. It was exhilarating! My brother in law screamed “Arriba! Arriba! Arriba!” with joy as then sped down the ramp. 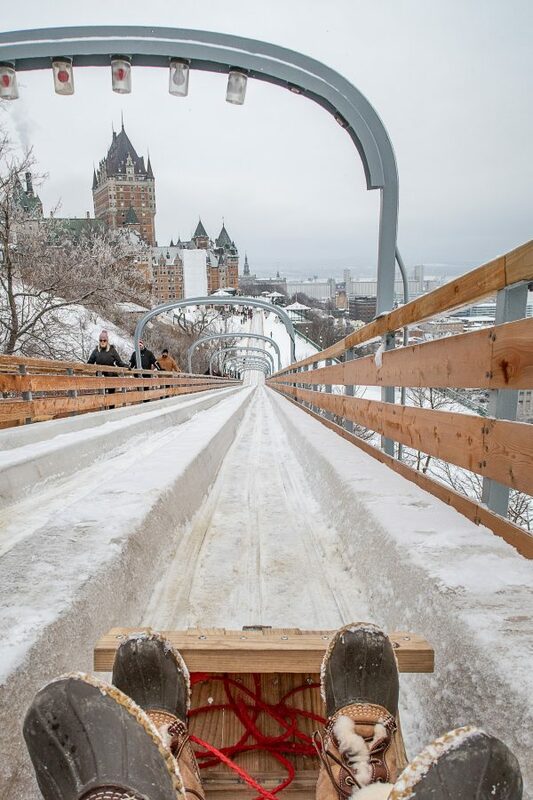 The triple chute toboggan run has been around for over 80 years and is located on Dufferin Terrace. Apparently you can go as fast as 40 miles an hour! You purchase tickets in a kiosk outside the Fairmont, and then you wait in line at the end of the toboggan track for a sled. Once you have a sled you climb to the top of the toboggan run and them zoom down the track racing two other teams. My video of the ride is posted above. Yes, the camera flew out of my hands and hit me in the face, but I think it gives the video a little more personality. 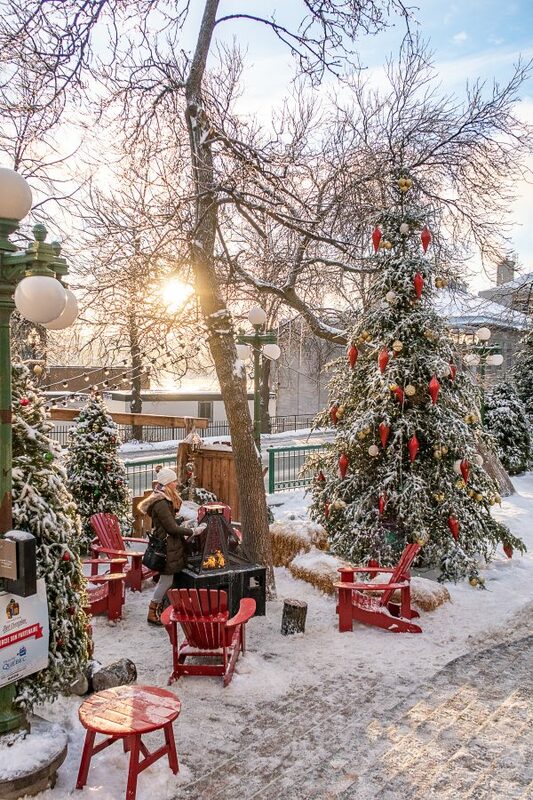 After a day of exploring Quebec City in the cold, you will want to warm up. 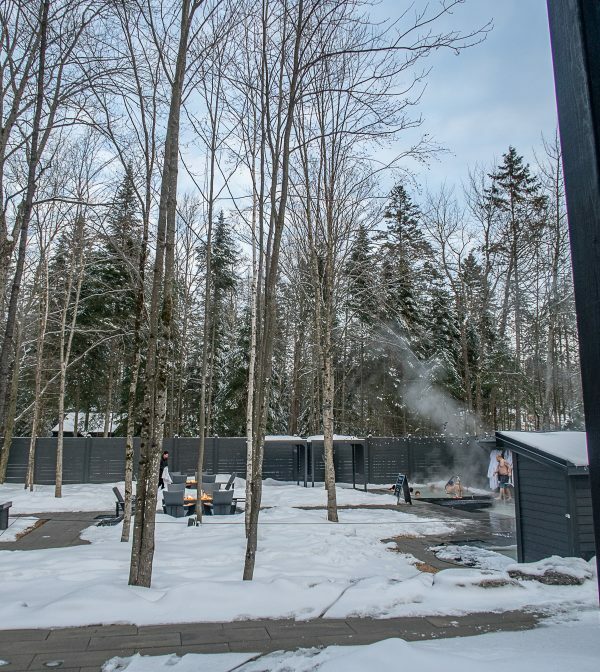 The best way to do this is at Siberian Station Spa, a luxurious day spa just outside the city with steam rooms, saunas, outdoor hot tubs and plunge pools, and relational yurts. 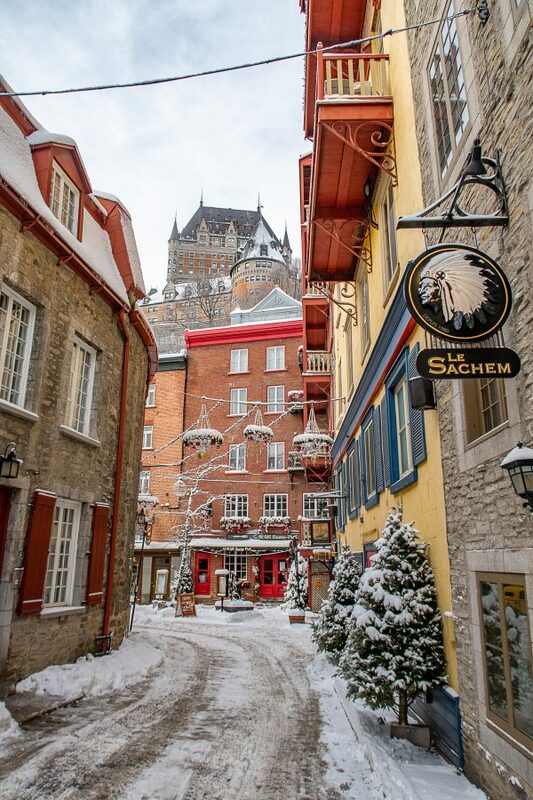 The only thing we would have done differently during out time in Quebec City it that we would have spent more time here. The prices are very reasonable! We paid about $35 per person which included a visit to the spa plus sandals and a robe. You need to rent the sandals and robe for about another $10 per person. The price is far less than what we have paid for similar spa experiences in other countries. 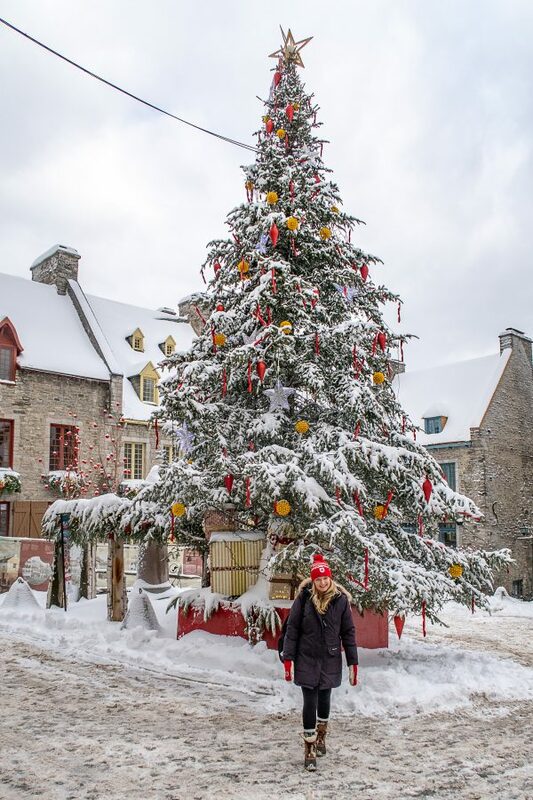 Mont Saint-Anne, a ski resort that hosts a wide variety of outdoor activities, is just a quick and easy 25 mile drive from Quebec City. 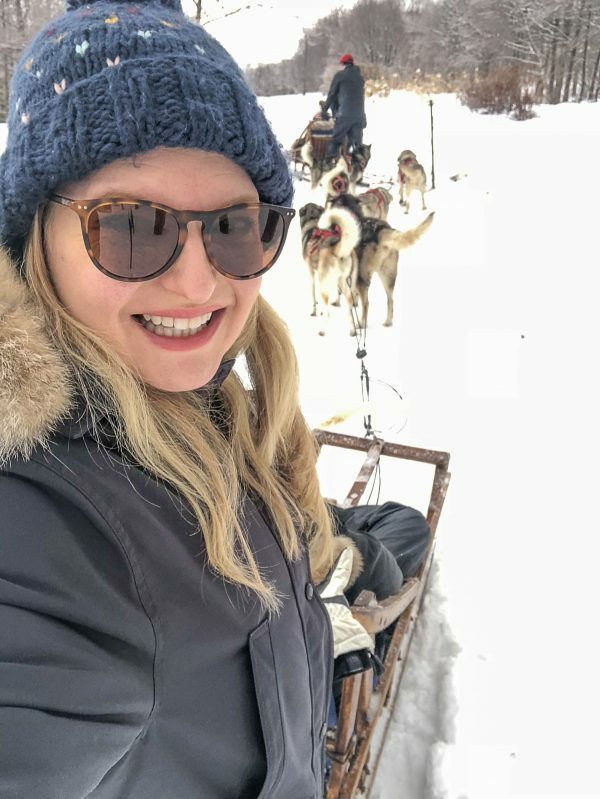 We went dogsledding with Les Secrets Nordiques, a company that runs dogsledding excursions and that rents snow shoes at Mont Saint-Anne. Definitely book in advance because this is a popular activity. 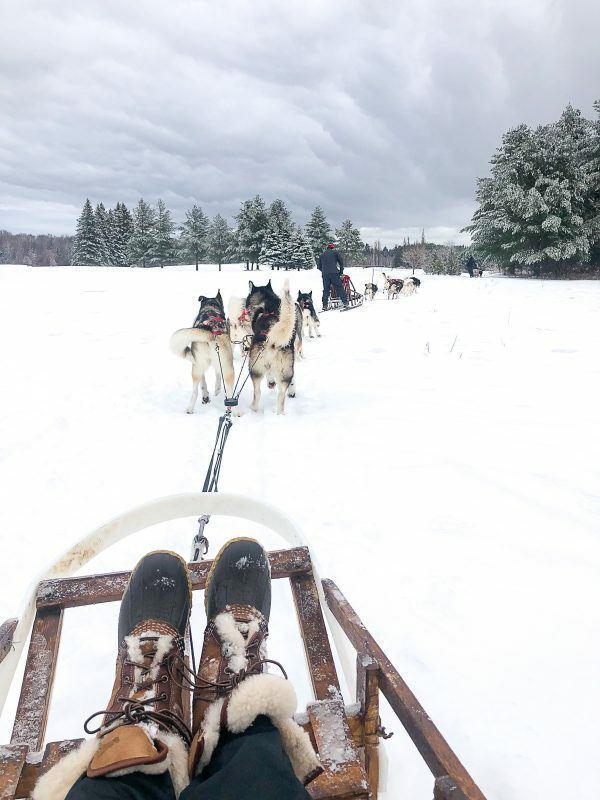 We love dogsledding. We first went in the Arctic Circle, and I am hooked. 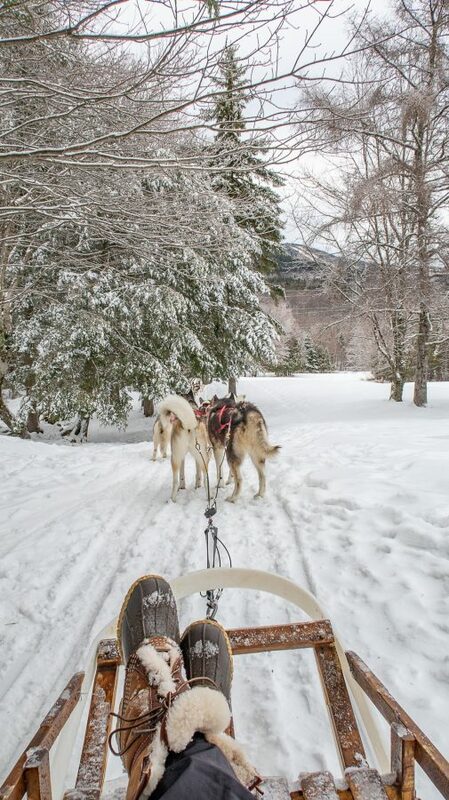 It is such an adrenaline rush to be zooming through the snow covered forest on a sled. One of the things that we loved about Les Secrets Nordiques was that they provided cold weather clothing like snow pants, parkas, and boots. We had our own jackets and boots, but needed the snow pants. I also recommend using hand and foot warmers. 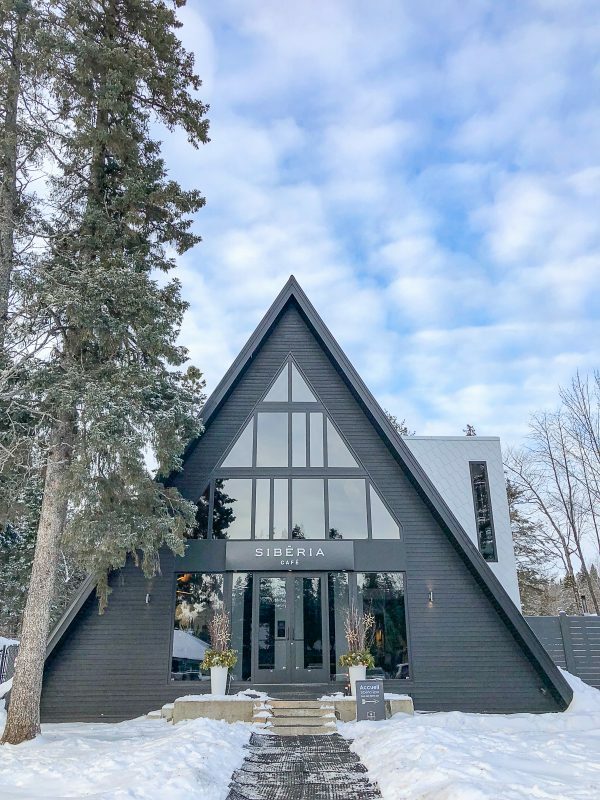 The cost is about $100 per person and they also over different packages that include snowshoeing and a spa visit. 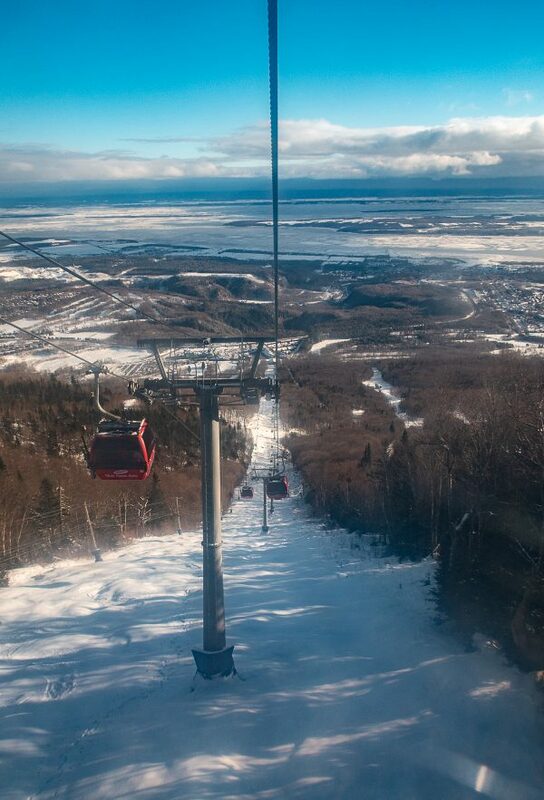 The primary reason people visit Mont Sainte-Anne is for the downhill skiing. Definitely dress in layers if you plan to go snowshoeing – we worked up a sweat and were shedding layers as we went. 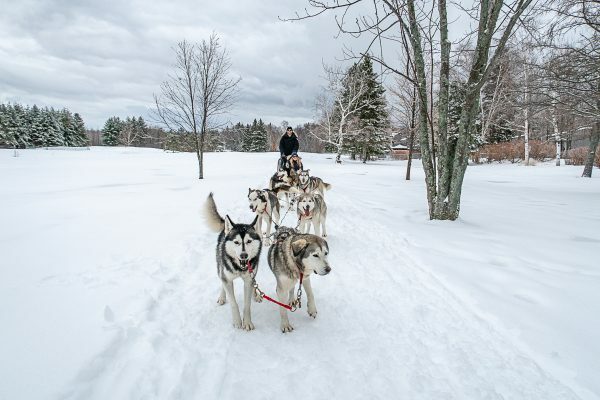 Yes, wearing skis and getting pulled by a dog is a sport, and you can try it Mont Sainte-Anne. If you don’t feel comfortable on skis you can also use a kick-sled. We simply rode up and down the mountain because we weren’t downhill skiing, but we rode the gondola so that we could take in the view that stretched from the mountain all the way to the St. Lawrence River. Mont Sainte-Anne is home to the larges cross country ski center in Canada. There are 200 kilometers of trails, and ski rentals are available. A reasonably priced restaurant within Fairmont Le Château Frontenac, this was our favorite meal of the trip. First off, they have a cheese cellar. I had no idea that those existed, but now I want one. The cheese plate was exceptional. 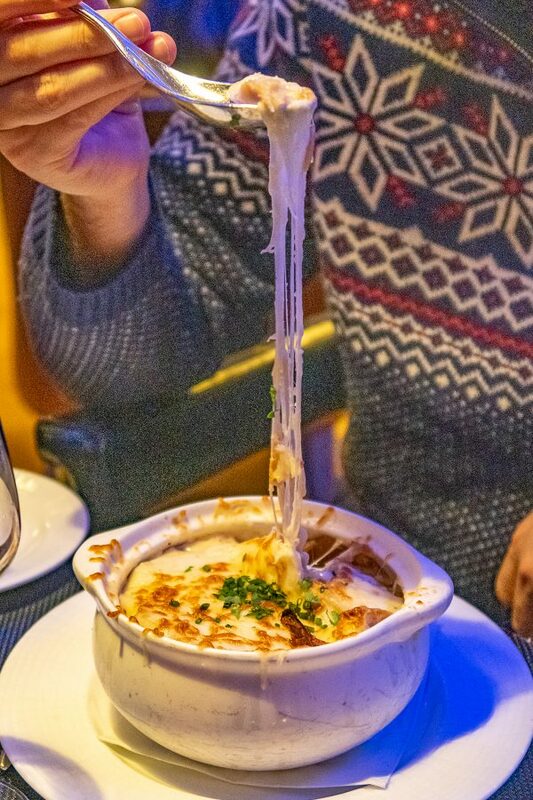 Charles said the French Onion Soup was the best he has ever had – and he has had a lot of French Onion Soup. I had super tender chicken with a mushroom sauces, Kelly had scallops and risotto, and the men got steaks. This restaurant has an upscale feel, but it is still dress casually. We loved the meal, the experience, the service, I can’t say enough good things about this restaurant. It is popular, so be sure to make a reservation. We celebrated my sister’s birthday during our trip, and we went to this classic steakhouse for her birthday dinner. The restaurant is located within the train station just beside the old quarter of the city. Charbon is a restaurant that is beloved by locals, and for good reason. The meal was everything we could have asked for. Our steaks were perfectly cooked, we loved the sides, and the prices were lower than what we would pay in Chicago. Artefact, located within the Auberge Saint-Antoine Hotel is famous for their hot chocolate. We were confused by the $17 price, but it didn’t seem unreasonable when it came out in a big pot filled with more than enough for all four of us. This was the best hot chocolate that I have had since I studied abroad in Florence. It was thick and tasted like a milked down chocolate bar. Try to get a cozy table off to the side of the bar next to a fireplace. 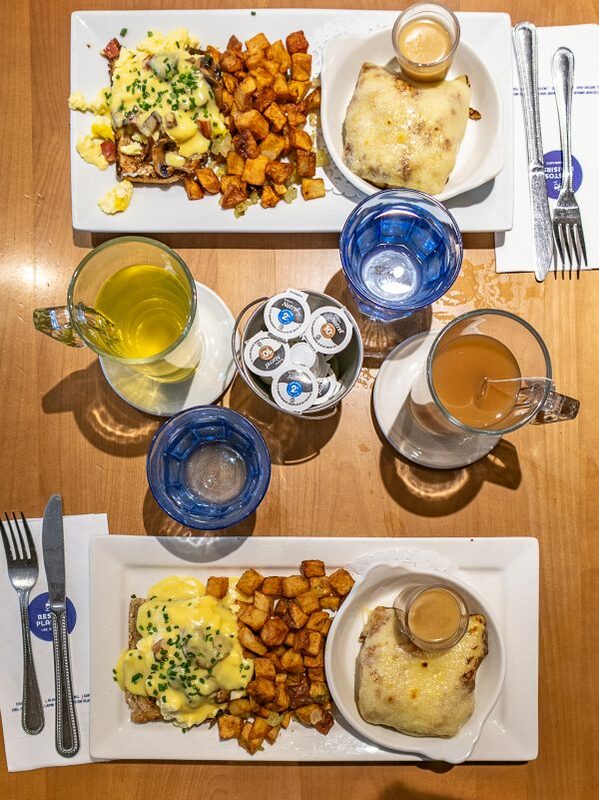 There aren’t many breakfast/brunch options if you are up early, but Cochon Dinque opens up at 7am on weekdays and 8am on weekends! 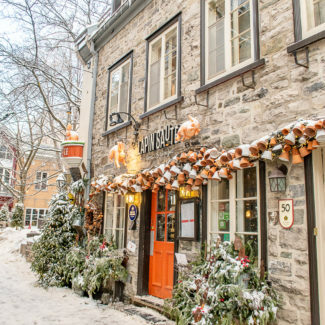 Plus, there handful of locations in Quebec City. We just loved this place – the Paris meets nautical decor was chic and not cheesy, and the menu has a large mix of sweet and savory options. Kelly and I got a breakfast that mixed sweet and savory and had a poached egg with mushrooms and hollandaise on top and a crepe! This uber-popular bakery is the place to get a casual bite to eat. It’s definitely the place to go if you want to grab pastries and coffee for breakfast. It is also one of few options for a late afternoon snack. A restaurant that serves up classic French cuisine. The menu has items like tartar, duck confit, beef tenderloin, and salmon. Charles and I stopped in for a cheese plate and glasses of wine, and I loved the goat cheese. We chose this restaurant both because it has great reviews online, and because it was super cold and we were staying at Port-Royal Hotel where the restaurant is located. The restaurant doesn’t feel like a hotel restaurant, and the food was impressive. Charles and Andrew shared a prime rib dinner for two, I had steak and potatoes, and Kelly had pork with risotto. We liked the hotel too, it was affordable, had a great location, and dog friendly which was key since Kelly’s dog Milo joined us on our trip. A low key burger joint, we ate here the night we arrived in Quebec City after a snowy drive from Maine. There is a full menu of different burger options. 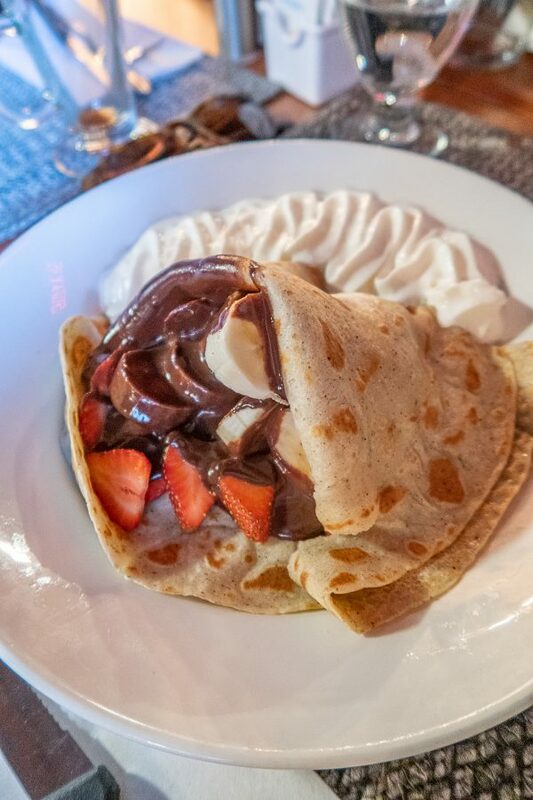 A creperie on Rue du Petit Champlain that serves both sweet and savory crepes. We enjoyed the meal, but it did take over an hour from placing our order to being served, and the restaurant wasn’t busy at the time. We thought we were popping in for a quick snack, but learned otherwise. The crepes were good though! A little bar with stone walls located in an old house that was built in 1668, this place is filled with character. We had glasses of wine to warm up from the cold, but they serve food too. The pub is known for hosting blues bands. Charles and I had beers at this bar located in a stone cellar of a house that was build in 1754. They have a big fireplace and plenty of board games. 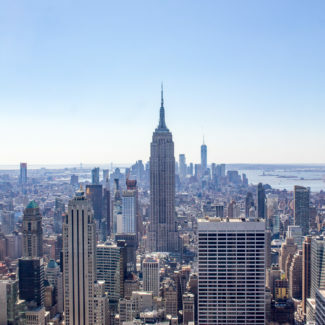 The exchange rate is in American’s favor, making Canada an affordable vacation destination. Prices at hotels and restaurants seem to be the same as they would be in America, but the exchange rate basically gives you at 25% discount. 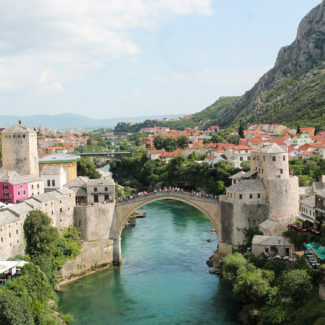 If you want one thing away from reading this post, I want it to be that there are many wonderful places to explore nature within just 45 minutes of the city. 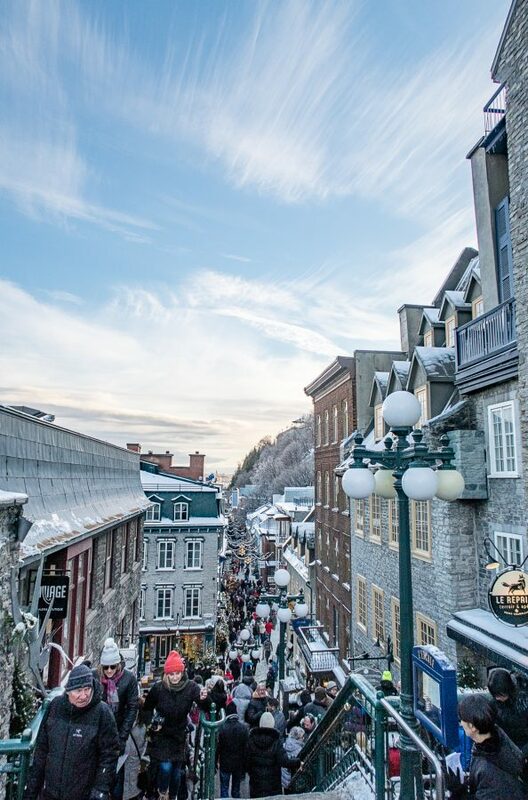 You won’t want to miss these opportunities to embrace the outdoors, so drive to Quebec or rent a car. 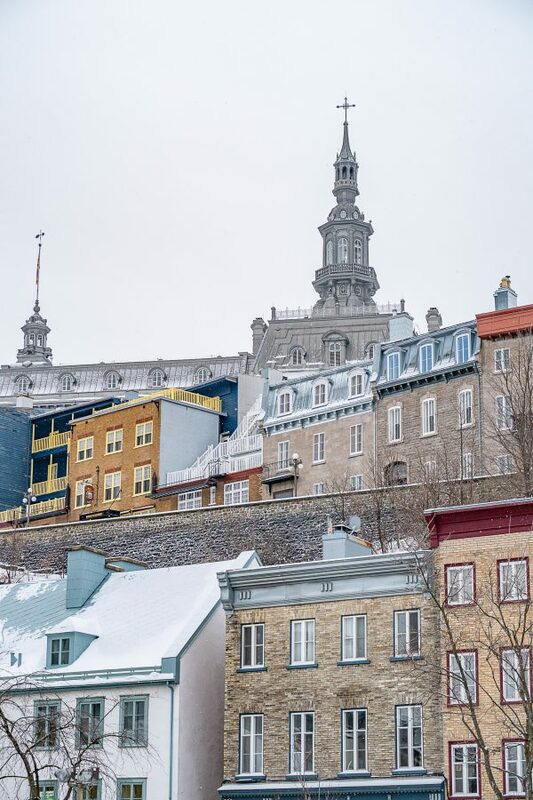 This is a bummer, but there are very few direct flights from U.S. cities to Quebec City. 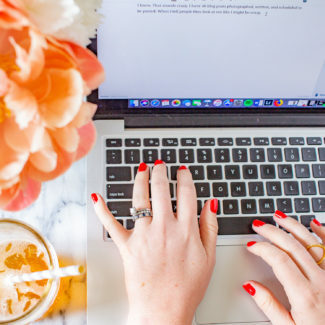 You will likely need to connect through Toronto, which increases your travel time. If you are in the northeast, it is probably best to drive. We spent a night in Vermont on the way from Quebec City back to New York City. Winter in Canada is no joke. Be prepared. You will want to pack hand warmers and foot warmers, and you will want to wear two layers of pants or snow pants over your pants. I recommend wearing tights under jeans, or leggings under joggers. To be blunt, we weren’t very impressed with the snow removal in Quebec City. The sidewalks were very icy – we almost fell several times each day. Pack snow boots, you will need them. While the official language is French, everyone speaks English and restaurants will happily provide English language menus. You want to wear layers, and you want to bring warm boots, a thick parka, and cold weather accessories.